Hi there, my darlings! I've had this next review all planned out and I've been waiting for the perfect moment to post it! And that moment is HERE!! What moment you may ask? A restock, of course! =D Many of you asked me when Smitten Polish would be restocking some of the GORGEOUS holos I gave you all a sneak peek of on my Facebook and I'm happy to say that the wait is OVER--Noelie will be restocking several of her holos tomorrow, November 19th at 3 pm CST (which is 4 pm EST)! YAY!!! 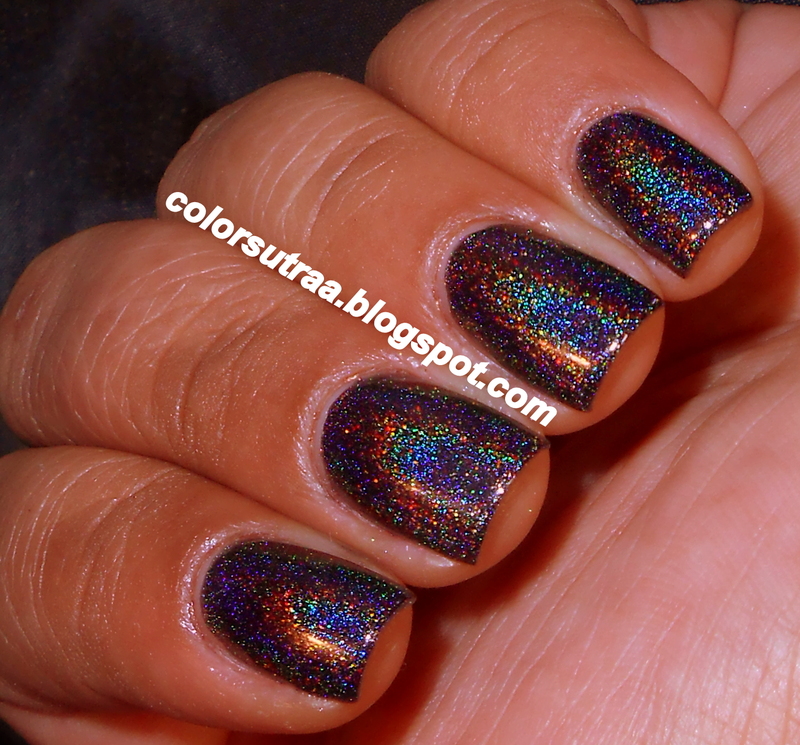 First up I have for you Cauldron of Rainbows--a black, extremely linear holo! I found both the application and formula of this polish to be a dream and the swatches below show 3 smooth coats by itself. If you love a good black holo, you DO need this one!! Next up, I have for you What Sorcery Is This?--a stunning bright purple mega linear holo! Again, no issues with formula or application and the swatches below 3 easy coats by itself. I cannot begin to tell you how MUCH I love this particular shade of purple--it's just breathtaking!! Now many of you saw my swatches of Harold's Crayon HERE and may be wondering how it compares to What Socery Is This? Never fear because I anticipated this moment and also have a few comparison shots of What Sorcery Is This with Harold's Crayon, with and without flash! The swatches below show 3 coats of Harold's Crayon on the index and ring fingers and 3 coats of What Sorcery Is This? on the middle and pinkie fingers--the first pic is without flash and the subsequent two are with flash! If I'd have to judge the two, I would say that What Sorcery Is This? is even more of a linear holo and has cool blue undertones, when compared to Harold's Crayon. Last but definitely not the least, I have a polish that is not a holo but which I requested specifically to swatch from Noelie, because a.) it's drop-dead gorgeous and b.) I had a comparison in mind for this one too--I present to you Klaatu Barada Nikto, a stunning blurple (bluish purple) jelly with tons of holographic microglitter! Both the application and formula on this was perfect (just the right consistency--not too thick, not too runny) and I used 3 smooth coats for the swatches below, topped with 1 thin coat of G&G's HK Girl to finish the look. I am so in love with this polish! GAH!! A couple of blurry shots, with and without flash! So there you have it, my darlings! If you need to add any of these beauties to your collection, don't forget to check out the restock tomorrow, November 19th at 3 pm CST--you can find them HERE for the price of $11.00 for a full-size, 0.5 oz bottle of either holographic polish and $9.00 for a full-size, 0.5 oz bottle of Klaatu. You can also follow Smitten Polish's Facebook page for the latest information on restocks! Questions, comments, suggestions? I'd LOVE to hear from you in the comments section below! Hey, nice pics! However, You have the wrong name on the black one, it's called Cauldron of Rainbows! I'm so glad I found you!! What a great review!! As I told you I have klaatu barada nikto and today was another restock so I ordered Harold's crayon and what sorcery is this? I had a few questions and your review answered them! !